The Bora is a wind that blows in a North North-Easterly direction from the mountains into the Gulf of Trieste. It blows intermittently with gusts that can occasionally be very strong. In Trieste the Bora is said to be "dark" when there is cloud, rain or snow, and "light" when the sky is clear. Trieste and the Bora are inseparable. Trieste is the city of the Bora and the Bora is the wind of Trieste. When it arrives, the city wakes with an intense shudder. Trieste residents love it and endure it, but cannot be without it; when it isn't blowing, they hope for its return. It is an essential element of this city, perhaps because it sparks real and intense emotions that few can ignore. The light becomes clear and the wind-buffeted sea takes on incredible reflections and shades. In winter, the lashing wind leaves you breathless, its howl providing evidence of its intensity. In short, the wind is energy in its purest state and it seems almost as if you can somehow absorb it and make it your own. 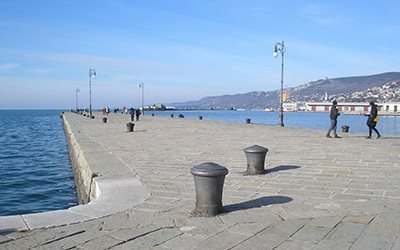 Many people say that Trieste residents are all mad because of the Bora; it is certainly true that if there were no wind, they would be different. The Bora has an undeniably energizing effect that excites the mind. In fact, the word imborezà in the local dialect means someone who is animated, but not in a negative sense, because the Bora is gaiety, lightheartedness and absolute beauty. When Trieste is lashed by the Bora, its beauty is extraordinary. Writers and poets of every type have dedicated verses and passages to this wind, almost as if it were flesh and blood, but perhaps in reality it is even more, it is the spirit of Trieste.